We had a busy week in FS2 Red this week. In Topic we explored the celebration of “Diwali”, the children looked at how people around the world celebrate Diwali, and what the word means (festival of lights). We examined the similarities and differences of how Eid and Diwali are celebrated. We read the story of “Rama and Sita” and learned why Diwali is “the festival of lights”. 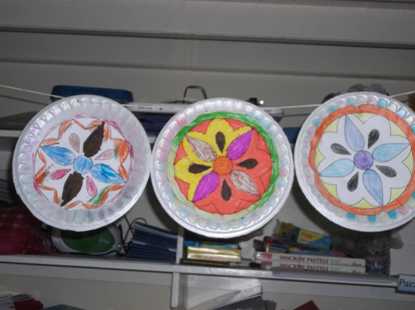 We created our own Rangoli pattern plates (using symmetry and beautiful colours) to hang up in the classroom. We also learned a lovely song about Diwali. This week in phonics we moved onto Phase 3 and introduced the new sounds j,v, w and x. The children have been working very hard to blend and segment using their new sounds. In Maths, the children again focused on the numbers 1-20, this week learning how to count on from various numbers, recognising numbers 1-20 and how to form the numbers 1 and 2 correctly. The topmarks website is also fantastic to use at home with your child as it has numerous educational activities and games. We hope you found this week’s workshops on Science and Cursive Handwriting useful, if you have any questions please come and ask!